In addition to residential projects, Keuka Studios designs and builds commercial cable railings and stairs. Over the years we have crafted cable railings for universities, offices, hotels, and restaurants. 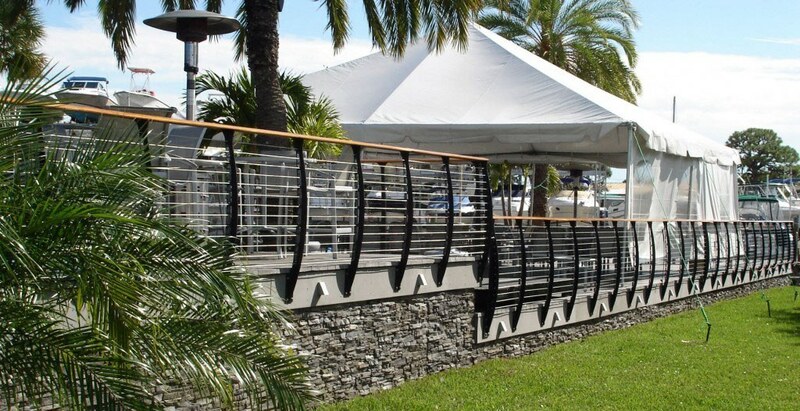 For example, you can find our railings at some Starbucks cafes in Hawaii and California. The engineers at Keuka Studios design custom cable railings and stairs that meet commercial building code requirements and ADA standards. Perfect for indoor and outdoor applications, our commercial railings and staircases can add an open, modern feel to any business space. This hotel sits right behind the Hampton Marina, a port on the Chesapeake Bay. When Resort Interiors renovated the hotel, they chose a nautical theme for the hotel lobby. To emulate the look of the shoreline, they built a raised, teak and holly platform surrounded by blue carpeting. 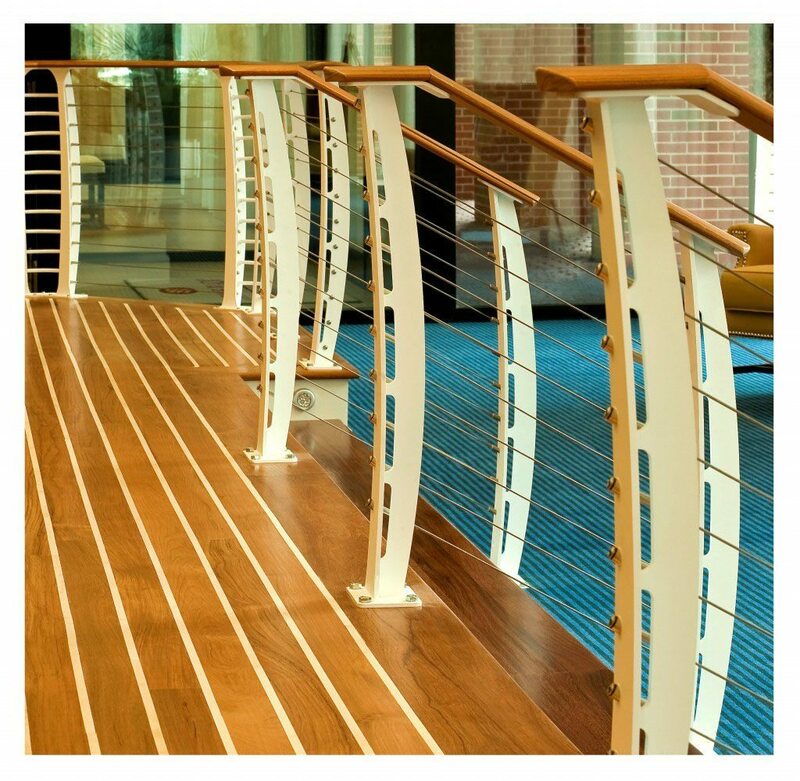 They wanted the railing leading up to the platform to imitate the railings found on ships and yachts. The interior designers chose our Keuka Style railing for the job. 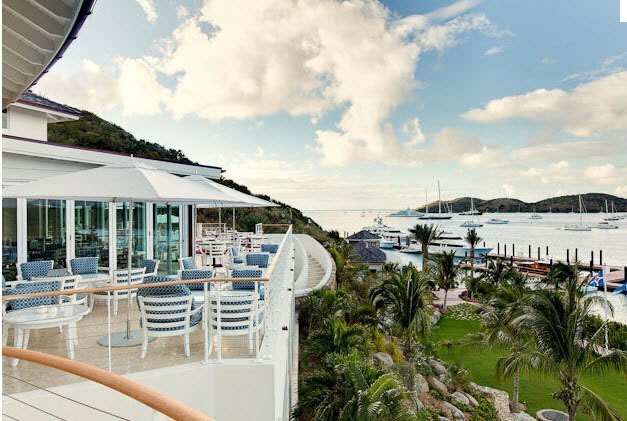 The Italian Yach Club Costa Smeralda has a second luxury marina in the British Virgin Islands. Located on the beautiful Oil Nut Bay, the clubhouse overlooks the gleaming ocean. The architects for this resort wanted a simple cable railing that would be able to withstand the elements in the salty oceanfront environment. Keuka Studios designed and built an Ithaca Style railing with a custom cable terminal. The observation deck at the National Lewis and Clark Interpretive Center has a panoramic view of the Missouri River. The architects of the center wanted to preserve this expansive view with a cable railing system. They chose our Ithaca Style railing because of its sleek, slender design. Ozona Blue Grilling Company, a feature of the Home Port Marina, looks out at the beautiful Palm Harbor. This luxurious marina has numerous amenities, for example, the hot tub and pool. The restaurant deck looks out at the pool and at the ocean beyond. In order to preserve this stunning view, the restaurant owners opted for cable railing to enclose the dining area. Our Keuka Style railing provides a barrier without obstructing the beautiful view or the ocean breeze. Keuka Studios designed and built this railing system for the hospital in Medicine Lodge, Kansas. For the job, we modified our Keuka Style railing posts to accept a round top rail. Also, we made the posts shorter than our standard design because the railing system sits on top of a concrete wall. The cable railing matches the awning on the building and gives the exterior an intriguing modern look. Located right on the water in The Woodlands, this mixed-use development features a relaxing outdoor seating area. Because the deck juts out over the lake, the architects wanted a railing that would blend in with the water. 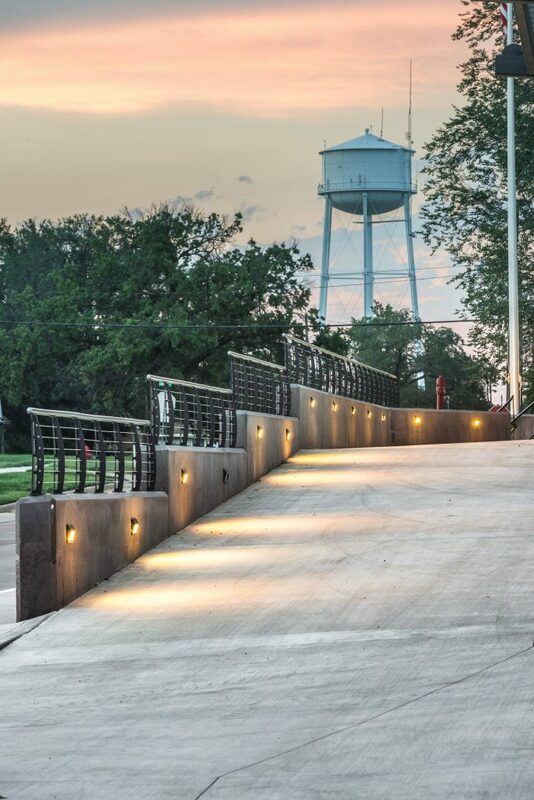 They chose our Ithaca Style railing with “Sparkle Silver” powder-coated steel posts. As a result, the railing maintains the natural view from the deck. Keuka Studios designed and constructed this rustic staircase and cable railing system for an office in Philadelphia. The company wanted an unpolished, natural appearance for their main staircase. In order to achieve this look, we used reclaimed paduak wood for the stair treads. In addition, we coated the steel stringer and railing with a clear matte finish. This coating protects the metal but preserves the natural, straight-from-the-mill look of the steal.